Mariano Vallejo controlled much of what is now the North Bay during the 19th Century. He was also the founder the city of Sonoma. Henry Ernest Boyes discovered a natural hot spring while digging a well. Building a bathhouse and hotel around this discovery, Boyes catalyzed the era of the springs in Sonoma, attracting hoards from San Francisco. The springs were later used by the U.S. military during World War II to help soldiers unwind. Captain William Smith is one of the oldest members in the cemetery. Smith was a soldier in the Revolutionary War. He was also a career sailor, boasting an impressive 8 trips around the world before his death in 1846. John McCracken is most well known for being a member of the Donner party. The story goes that when the group were at the crossroads on whether or not to take the infamous Hastings Cutoff, the McCrackens chose not to take the risk, taking the safer, more traveled route instead. The Mountain Cemetery is located at 90 First Street West and is open to visitors from 8:00am to 5:00pm daily. 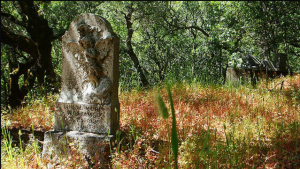 The Mountain Cemetery Walking Tour brochure can be downloaded and is are available at the Sonoma Overlook Trail kiosk. Photos and Brochures by Fred Allebach, Graphics, Scott Summers. This project is supported by The Sonoma Overlook Trail Stewards.